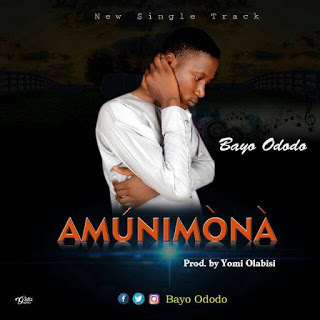 Amunimonna is a root music by Folk musician - Bayo Adeeyo famously called Bayo Ododo. After successful release of Iwalewa - Single which has gained him ground in the Music Industry, the Nigerian folk and root musician has deemed it fit to release another single with special tune, AMUNIMONA -This piece is purely root music with a unique melodious tune coupled with a great poetry lyrics.This song was produced by Yomi Olabisi -Yomi Apala. Bayo Ododo is an native of OGBOMOSO, SOUTH-WESTERN part of Nigeria. He is student of Ladoke Akintola University of Technology, Ogbomoso, Oyo State. His passion to promoting Yoruba heritages has always being a push behind him specializing in Root and Folk music. This another Single from his river of wisdom to humanity. Be blessed as you download and listen! Downloaded and its on repeat. Thanks to lautechportal.com for promoting good music.